The combination of species traditionally placed in Bunocephalus and transferred to Dysichthys by Mees (1989) are a paraphyletic group. 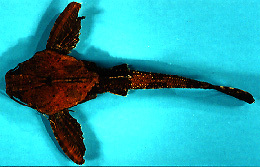 Friel (1994) attempted to make Bunocephalus monophyletic by transferring some species into "Pseudobunocephalus" and Pterobunocephalus. Although no unambiguous characters support the monophyly of Bunocephalus, no evidence exists that any of the species maintained in this genus share a more recent common ancestor with species placed in any of the other genera. Bunocephalus is the largest genus within the Aspredinidae and in addition to the valid species listed above there are several undescribed species. Bunocephalus has the widest distribution of any aspredinid genus (Magdalena, Orinoco, Amazon, Paraguay-Paraná & São Francisco) and is the only genus with members west of the Andes (Atrato, San Juan & Patia). Bunocephalus coracoideus, illustrated above, is the most common aspredinid species you might encounter in the ornamental fish trade. This genus of medium sized banjo catfishes (up to 120 mm SL) cannot currently be defined by any shared derived characters. Bloch, M. E. 1794. Naturgeschichte der auslndischen Fische. Berlin, 8: 1-174. Boulenger, G. A. 1902. Descriptions of new fishes and reptiles discovered by Dr. F. Silvesti in South America. Annals and Magazine of Natural History 7(9): 284-289. Cope, E. D. 1870. Contributions to the ichthyology of the Marañon. Proceedings of the American Philosophical Society, 559-570. Eigenmann, C. H. 1912a. Some results from an ichthyological reconnaissance of Colombia, South America. Indiana University Studies, 16: 1-27. Eigenmann, C. H. 1912b. The freshwater fishes of British Guiana, including a study of the ecological grouping of species and the relation of the fauna of the plateau to that of the lowlands. Memoirs of the Carnegie Museum, V: 1-578. Friel, J. 1995. Acanthobunocephalus nicoi, a new genus and species of miniature banjo-catfish from the upper Orinoco and Casiquiare Rivers, Venezuela. (Siluriformes: Aspredinidae). Ichthyological Explorations of Freshwaters, 6(1): 89-95. Ihering, R. v. 1930. Notas ecologicas referentes a peixes d'aqua doce do	estado de São Paulo e descripção de 4 especies novas. Archivos do Instituto Biologico, 3: 93-105. Steindachner, F. 1882. "Beiträge zur Kenntniss der Flussfische Südamerikas" IV. , Anzeiger der Kaiserlichen Akademie der Wissenschaften Mathematisch-Naturwissenschaftliche Classe, 19: 175-180. Page: Tree of Life Bunocephalus Kner 1855. Authored by John P. Friel. The TEXT of this page is licensed under the Creative Commons Attribution License - Version 3.0. Note that images and other media featured on this page are each governed by their own license, and they may or may not be available for reuse. Click on an image or a media link to access the media data window, which provides the relevant licensing information. For the general terms and conditions of ToL material reuse and redistribution, please see the Tree of Life Copyright Policies.